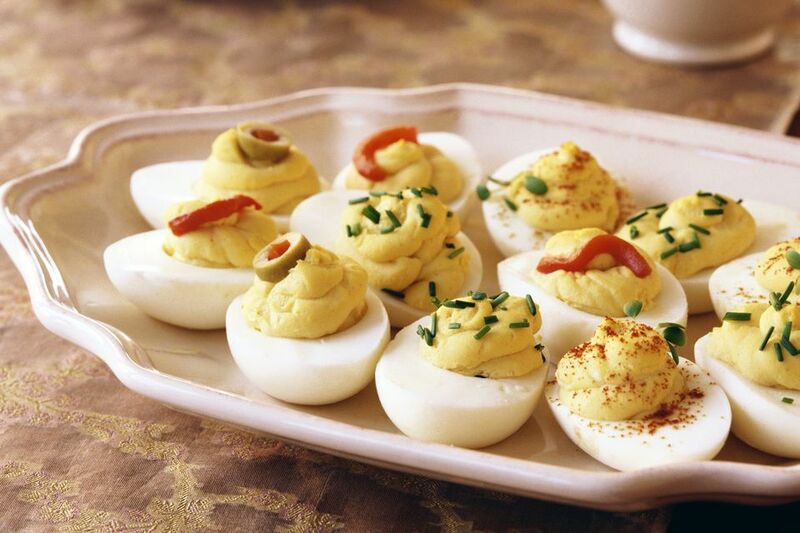 These simple deviled eggs are flavored with a touch of mustard along with the mayonnaise. I top them with olive halves, but sliced cornichons, diced roasted red bell peppers, or other toppings may be used. Fresh snipped chives would make an excellent topping as well. This recipe makes 1 dozen stuffed deviled egg halves. The recipe is easily scaled up for more. Cut 6 of the hard-boiled eggs in half lengthwise. Scoop yolks out of egg halves. Press the yolks and the remaining whole egg through a sieve into a small bowl or finely mash with a fork. Stir in mayonnaise and mustard and then season to taste with salt and pepper. Fill the egg white halves with the mixture, mounding slightly. Sprinkle each filled egg with a little paprika, if desired, and top each deviled egg half with an olive half, cut side up. Makes 1 dozen deviled egg halves. Add finely minced ham to the filling mixture. Top deviled eggs with diced cooked bacon pieces. Add a touch of curry powder to the deviled egg filling mixture. For a party, arrange the deviled eggs on kale leaves with cherry tomatoes and kalamata olives scattered around the eggs. Add fresh herbs to the egg yolk filling. Chives, parsley, tarragon, and dill are excellent choices.